Azariel is a fair-skinned elf, just leaving his adolescence for adulthood. His perfect teeth, strong jaw-line, and intense blue-grey eyes make most Human and Wolfen girls swoon, though due to a slightly hooked nose he isn’t gorgeous for an elf. He has shaggy golden brown hair, and most who see it would call it “Feathery” for the way it swoops out at the ends in random places. He has a long beard, with his cheeks shaved low, accentuating his jaw-line, and the goatee pulled into a tight, sleek braid, mimicking his Lord, Osiris. It is adorned with 6 beads each inscribed with the sign of Osiris on ornate copper wire wrapping it. He has an average build for an elf, at 6’2” and 180 lbs. While out of combat, he always has a toothy grin, and is always ready to joke. While in combat, he is harsh, focused, and almost ruthless. He is never without a polished rounded shield, adorned with the Crook and Flail, and his magical mace, Xama’sconde, which has fire eternally dancing along its two feet of polished Iron, and roaring from its war-hammer-like head. The only catch is that it is invisible to the naked eye, so only those that can see invisible see it’s beauty. He wears a yellow wide-brimmed hat, starched and oiled to stay out of his eyes, even in rain. His cloak is yellow as well, with a large hood. It is hemmed with leather made from a light-skinned animal, with runes etched into it. 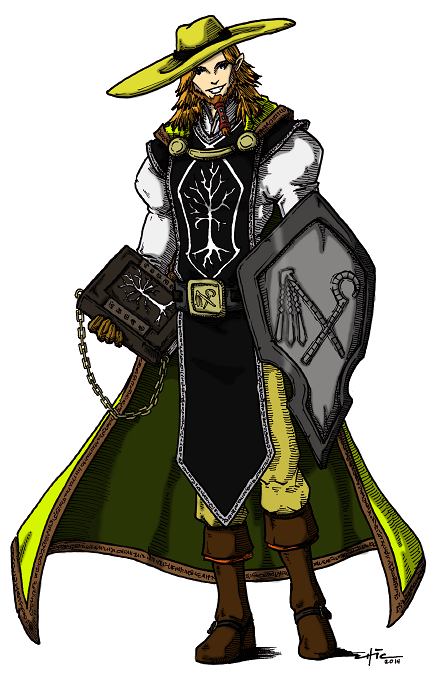 He wears a tabard of his guild, black with a white leafless tree with its roots exposed, over a loose white shirt with tight cuffs, tucked into his baggy tan pants held up by a wide black leather belt. His very loose pants pouf at the calves, where they tuck into soft leather boots. Finger of Osiris Armband 1 Worn Finger of Osiris attached to the right arm under the baggy shirtsleeve, with a slip-knot wristband for easy attachment. Xama’sconde 1 Worn Invisible flaming mace, in a special sheath worn on the hip. Small Iron Shield 1 Worn Polished Iron Shield, worn on the back, protecting the delicate tools and jars in the bags. Yellow Cloak 2 1 Worn, 1 in Backpack Simple cloth cloak with a deep hood, died yellow. Waterskin 3 Worn Large Waterskin. Full. Rope 40 Backpack Feet of rope, travelling quality. Tent 1 Back Pack (Tied to top) Simple tent fits two full-sized elves. Book of CrIsis 8 Backpack The complete set of books of CrIsis, underlined and annotated, mainly referring to strengths, weaknesses, exceptionally lucky moments, and any decree or blessing of the Gods toward CrIsis as a group and individually. Strengths and Weaknesses of CrIsis 1 Backpack Six sheets of parchment, each describing the strengths and weaknesses of each group members, all of which have been secreted into the Fifth Book of CrIsis. THIS IS ALL ENCRYPTED. REQUIRES CRYPTOGRAPHY ROLL TO READ UNLESS READ BY AZARIEL. Book of Magic 2 Back Pack Two ancient texts, written in Dwarven, one depicting Invisibility: Superior, and how to enchant a weapon with it, the other saying something about cancel magic, and enchanting a weapon with it. Taken from the Etrinan Ruins. Crystaline Locket 1 Large Sack Crystal, contains a likeness of Adriana. Cockatrice Skull 1 Large Sack Has been cleaned and bleached. The symbol of Force has been carved into the crest. The carving is painted brown with mud every morning. Fits on Azariel’s Head, as a skull cap. Parchment 12 Backpack Simple parchment for writing. Graphite Stick 4 Backpack Simple, not allocated to a specific circle. Chalk 2 Backpack Simple, not allocated to a specific circle. Candle 1 Backpack Simple, not allocated to a specific circle. Endless Ink Quill 1 Backpack NEVAHENDINGINK inc.
Power symbol stamps 3 Large Sack One each of words Pein (Evil and Darkness), Ya-ahk-met (Light and Power), and Lo-Kum (Change, Transition, Dimensions) Made of Metal, requires that the writing substance be used to paint the stamp. VIP Backstage Backdoor Unlimited and Forever pass 1 Large Sack Caer N’tibby Midnight Players. Salt 1 Small Sack Cloth sack filled with 1/2 pound of salt, dipped in wax. Gems 4 Small Sack Emerald, Onyx, Ruby, Sapphire. S’van 1 Small Sack Eye of S’van in Baalgor Mountains. Saddle Bags 2 Lictalon Leather saddlebags strapped over the horse’s polished plate war barding, Ya-ahkmet. Magic:Superior 1 Large Sack Liquid Gold(Draw); Sealed in blood. Insect:Gnats 1 Large Sack/ Menagerie Dried Gnat bodies(Draw); Giant Cave Spider in an aquarium. Ghosts and Entities 1 Large Sack/ Menagerie Owl’s Blood(draw); 2 Live Toads. Menagerie Various Cages and Aquariums in Azariel’s Cabin. Azariel was born in the Western Empire. He lived for a long time with his father Sezar Aleayacta, who was an expert in the lost art of Conjuration, travelling from town to town; his mother wasn’t in the picture, and there were half a dozen stories to explain why, none of which Az believed. Always one for flourish and ostentation, Sezar would perform like a gleeman or bard in inns and for parties. With a conjured flash-bang or two, a dove, butterfly, or a bouquet of flowers, he’d wow crowds. His talent wasn’t purely magic, he had a manual dexterity that even his non-magical ‘conjurations’ and ‘disappearances’ were perfectly believable. He had a voice, too, that could weave a tapestry almost better than the loomiers of kings. He and his lute would finish up the night, and that’s where he got his ‘room and board.’ Az had ‘regular’ ‘aunts’ in every town that they passed more than once. Azariel learned the Cello, and would accompany Sezar when he was deemed good enough. Sezar taught Az about the world; Kings and Queens, Priests and Priestesses, Wars, Famine, Peace, Prosperity, The Light, and The Dark. He taught Az to the level of any King’s Heir, with twice the cynicism. Mainly, he taught him of the Elf-Dwarf war. ‘Such a stupid and pointless squabble, so long ago, between our people and the midgets of the north, yet it reshaped the world. So many great things were lost, and so many terrible things were brought forth.’ Magic was a subject all its own in these studies. Conjuration was only half of what Az learned about in his childhood – with the gravity impressed upon him of ever letting the secret out of Sezar’s practice of the lost art. He was taught of all of the different kinds of magical servitude and manipulation; Blood Magic, Summoning, Circle Magic, Ward Magic, Enchanting, Rune Magic, Druidic, Elemental, Sorcery, Wizardry, Alchemy. Though Sezar wasn’t even an apprentice in any of them, he taught Az that all have their strengths, their uses. For instance, you’d be hard pressed to make a Magic Rune weapon with only Elemental or Druidic magic, but you’d also not be able to commune with the elements and elementals themselves without them. Even within each magical school, there are different paths that you may take. Not every Wizard is a crackpot in a lab, and not every Diabolist scroll is defensive. As a child Az was overwhelmed with the breadth and depth of the world of magic around him; so much vibrancy and so many colors on the painter’s palate. It was then that Az decided he wanted to study it all. He had centuries yet to discover himself, so he had no reason to shackle himself now. He saw such a bright future, for him and his father. He and his father traveled for most of his childhood. When he reached the age of 60, his father became seriously ill, and couldn’t travel the way they used to. In need of room and resources to support him and his father, Az applied for Guild membership with the Guild of the White Ash. He was accepted, and studied the art of Summoning. He found it came easily, and they were as good a school of magic as any for him to get started in. His teachers were astonished at his aptitude, but they did not advance him in the ranks quickly, as he was prone to mischief, pride, and recklessness – he regularly returned to his guild-appointed rooms penniless and sometimes flogged. The free time that he didn’t spend playing tricks and gambling, he spent in the library. He was fascinated with the great Strategists and Warriors of old. He would follow their lives, or as much as he could find of them, from birth to death and study them. It was then that his beliefs in Luck truly came to the surface. The Greats always had Luck on their side, not just Wisdom and Intelligence. He had always had a courtship with Lady Luck, in his pranks and gambling, but he had never truly seen that he was more than a simple thrill-seeker. He truly believes in Luck and Azar, Unluck in the old language. In part, this might come from his name – one of the few things he had of his mother’s. Azariel: Omen of Bad Luck. His love of history and his hobby of voracious reading led him to the history of a god by the name of Bes. He was the god of Mischief, Feasting, Gaiety, and – of course – Luck. He fought alongside the gods of Light, and had great confidence in Osiris. The God, Bes the Depraved, was truly the representative of all that he held as true and self-evident – at least most of it. Azariel studied and worshiped Bes, and probably due to that was pulled toward Summoning, whose acolytes generally lean toward the Dark. Az came across a demon by the name of Helgriven, a Night Owl, while studying Summoning. Helgriven became his demon adviser, who was grooming him to be an alchemist zealot to the glory of Bes. The Demon explained the amount of luck tied in to the Enchanted Cauldron; each one was like a whole night playing ‘Carriages’ in the town, without the possibility of a lender beating him senseless. Az was swept away in the anticipation. Feeling that he had learned the basics of Summoning, and spurred by the thought of the Enchanted Cauldrun, He informed his Summoner mentor of his decision, and the Guild assigned an Expert for him to study under, the Wizard Eugene Schpaknel. He learned all he needed to make an Enchanted Cauldron, and after a month or two studying, he set about putting it together. ‘Be gone, friar. I have an adviser, and he is more powerful than you. Bes decides my fate, and if it is his wish to plunge me into darkness, it will be a toss of the dice that reveals my end, not some senile priest.’ As Azariel spoke thusly to the priest, a Ramen descended from the heavens in a column of light. Az’s eyes were covered as if by wool, and all went black. Then, a spot of light in the distance sped toward him as if shot from a bow. It stopped ten feet from him, and he saw that there was a form in the middle. He gasped when he saw it was him, ragged and naked, in the center of a globe of light. Blood trickled from wounds under his hair, and poured from lacerations on his back. ‘Yes, master. I wish for nothing more. Please, touch me with thine hand once again.’ With that, a cat of nine tails lashes his back again. A blood curdling shriek of pain laced with ragged ecstasy filled Az’s ears, and suddenly he realized that the noise was coming from his own mouth. He could feel the cuts made by bone and glass in his back, and feel the sickly wet-warm sensation of his own blood running down his spine. He also could feel inside his own head, a festering illness he had never known. He looked at his own blood, and ragged flesh, and became hungry, anticipating. He raised his hand to his mouth, and bit down on the tip of his thumb, and ripped away with his teeth. The same ecstasy-laced pain-filled shriek filled his ears, though it did not come from his mouth, it was an echo, a memory reverberating through his skull. His teeth, which felt shorter than he remembered, ground his nail, skin and muscle into an enjoyable paste. ‘But Bes once was jovial, a free spirit. He was the god of Gaiety, Luck, and Feasting! Can you not see that in him? Do you judge so harshly?’ Az asked, putting forth a strong effort in voice, but distraught from his experience, and broiling with uncertainty within. Surely Bes couldn’t be that evil? Could he really deserve his name, ‘the Depraved?’ Everything he studied about the original Bes pointed to a god after his own heart. As he pondered, memories flooded through him, of bits and pieces of the current Bes, pieces he shut away unwilling to accept; stories of wanton blood and destruction of innocent people; blood sacrifices; dark rituals. He remembered what he was about to do, and what Helgriven had asked that he do to make the cauldron: murder two humans for the six pints of blood needed. He started to shudder uncontrollably, and felt as if something inside him deflated. He felt numb, and before he realized it, he was shambling his way into the Temple, into a prayer room, ushered by the Priest. He was vaguely aware of irritation toward the man, herding him so. He hit his knees, and started to sob uncontrolled into the pillow. Hidden, suppressed histories flooded into his mind, depicting the True Modern Bes, the Depraved. He prayed, though something stopped his tongue when he tried to utter his God’s name. Without the name to use, he resorted to, ‘O GOD! WHY HAVE I BEEN MISLED BY THEE?’ His mind was overwhelmed by thoughts of The Father, and a love from Isis herself calmed him. He looked up, and the Ramen and Priest waited, watching him. ‘There is no redemption for the Gods of Dark. They have chosen their path. You must stay away from them, lest they lead you to their destruction. Come unto the Lord Osiris, He Who Slumbers, He Who Shall Wake; He Who Is. The Father.’ The Ramen’s voice appeared as a crash of thunder, or a wave hitting a rocky shore. Az did what he could to stand his ground. ‘I need to think.’ Azariel said finally, and started shambling down the road to White Ash, not bothering to ride his flying shield. The Guild tower filled his vision step by step; fluted pillars and walls molded to look like a giant white ash, reaching over the small village surrounding it. It was the work of Earth and Fire warlocks, who were ironically refused entrance to the Guild, due to their methods. His eyes didn’t caress the illuminated granite branches tonight the same that they used to, though, as he was lost in his thoughts. Hours later, he arrived at the convalescent home that held his father. Despite the late hour, his father was awake, and they talked for hours about Gods, Ramen, Demons, and Magic. His hunger for knowledge, and desire to resurrect his God… Osiris… resulted in an extensive religious library in his little church. He became a regular at the bookstore in Shandala near the Pyramid, and purchased all he could find. In the last few years of Az’s search for solutions to the Osiris Problem, he stumbled upon a series of journals called ‘The Books of Crisis.’ It all astonished him. The Lady Herself taking an active part in his own mortal quest was too perfect for him to overlook. He has been following their exploits since the fateful day that the Sea Titan crash-landed on the Island. With every chapter, his faith in Luck and the Gods increased. There are times that any ‘unlucky’ person in CrIsis’ shoes would not have gotten through. He has lost count of the times that things that were strategic and statistic improbabilities were overcome and outright ignored by the unwitting champions. Oh, how they take their own luck and their gods’ hands for granted. The Dwarf that should have spent the rest of eternity as spackle for a Dragon’s armor stood up without so much as a batted eye lash (and no first-hand account, either.) That was more than any amount of physical or spiritual prowess could account for, and it is but one of the dozens of examples. I wasn’t planning on including him in this Bio, but Bungo seems to have joined our little 6-man army against the Dark! So it must needs be that I verify the claims to friendship between Benji and Azariel. They met when Azariel was in the tower, studying Wizardry, as Mr. Wz. Spacknel and Benji’s Master Wizard were close friends. They had plenty of fun together, though Azariel was sent off to the dice games from time to time so that Benji could ‘Get his Wand cleaned,’ using Azariel to help ‘Swoon,’ the dirty little scamp. He left the Guild shortly after his master passed, and came back few years later, thinking himself a freedom fighter, and spurring in Nipshanks, Azariel’s warder, a desire to do the same. When Benji returned Azariel tried to settle him down a bit, and give his life a bit more direction, by introducing him to the Deities. Though, every time Az brought Benji by the small Temple of the Church of Light, he spent all his time with the parishioners of Bast, so he suggested Benji catechize into her fold. Little did either of them know it would change their lives.